Remembering why we stop and commemorate June 16 – is Brand South Africa’s Youth month digital campaign for 2018. The campaign is angled at reminding young people to not only acknowledge June 16 as public holiday reduced to parties and copious drinking but to pay tribute to the school children who lost their lives during the 1976 uprisings in Soweto. The campaign is a reaffirmation that there are young people today who will become the leaders of tomorrow, who’ve taken up the baton left behind by the class of ‘76 and continue to play their part in fighting for their rights to ensure a better South Africa for the future. Brand South Africa’s Play Your Part ambassador, Mpumelelo Mtintso, a 29-year-old social creative entrepreneur, from Soweto, is one such young leader, who has never forgotten the meaning of June 16. He is determined to find solutions for a better tomorrow. “I believe there is a creative solution for each and every problem in the world. I expressed my desire to become an entrepreneur at a young age, but only made my first real move in 2014 when I started a creative agency called FRONT ROW SEAT MEDIA. It was about merging street fashion with street football, creating a platform for young people to showcase their fashion design skills and also to be active”, said Mpumelelo Mtintso. Mtintso has never looked back and in 2016 he started a creative tour company called BOOK IBHONI. BOOK IBHONI is a tour company with a difference, offering discounted bicycle tours when you donate a book or two. The collected books are donated to community libraries in need. The main objective of BOOK IBHONI is to give kids access to books they wouldn’t normally have. “Our vision is to influence a lot of young people to read more. 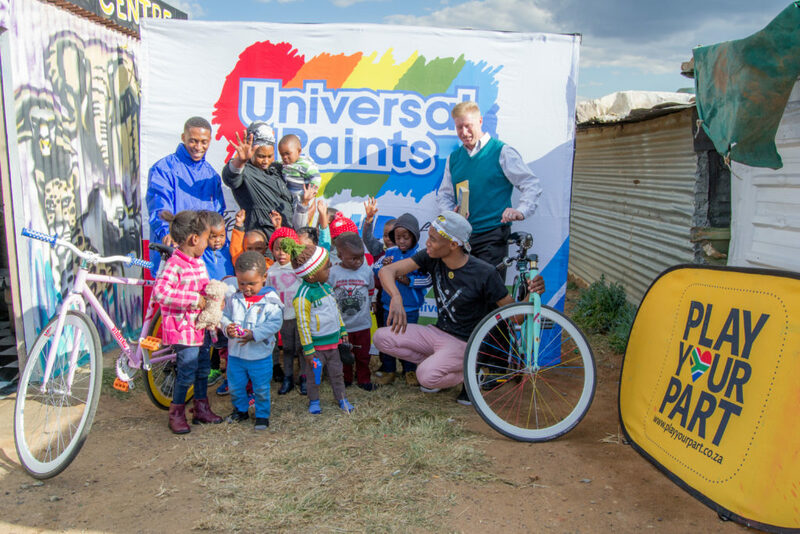 We have been collecting books that have thus far benefited the Orange farm library, Orlando West Children’s Library, Orlando Children’s Home and Nomzamo Kids centre – a township named after the late Mam’Winnie”, said Mtintso. Mtintso’s work is a step closer to fulfilling the National Development Plan (NDP) vision of ensuring an improved quality of life in a society for all. The Play Your Part programme first discovered Mtintso’s work in 2016 and immediately chose him to be a Play Your Part ambassador who has a positive influence in his community through BOOK IBHONI. 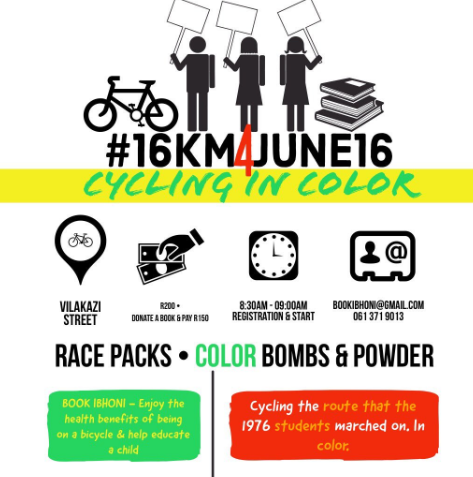 BOOK IBHONI has for the past 2 years been hosting a cycle ride called the JUNE 16 cycle challenge, where the chosen route is the actual route taken by the students on that fateful day in 1976 during their march. “We host these cycle challenges so that we can teach people about the history of June 16, 1976, and also to tell the stories our grandmothers told us of other heroes that stood up on that day. This year we are cycling in colour. In ’76 the students got thrown with teargas and grenades, we will be throwing colour bombs and powder paints to commemorate youth month in ‘rainbow’ nation style” said Mtintso. The purpose is to encourage young people to come together and discuss issues they face whilst finding creative solutions. “The spirit of Ubuntu is in me and all of us at BOOK IBHONI, uTata Mandela’s legacy reminds us that the future is in our hands, it’s all up to us now to keep his legacy alive, and I believe that at BOOK IBHONI we are doing exactly that. Promoting literacy is our way of contributing to a better tomorrow”, adds Mtintso.